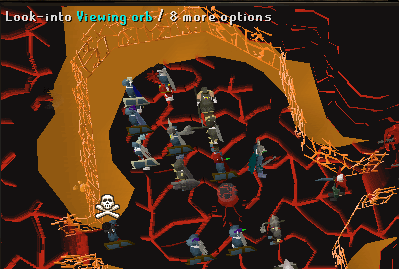 The TzHaar Fight Pit, located below the Volcano of Karamja, is full of death. It's a game much like Castle Wars, although it more of an "every-man-for-himself" type of game where even your friends will be forced to turn on you in the heat of battle! Although this Activity may be considered simple to play, you should know a few things before charging in there for battle. 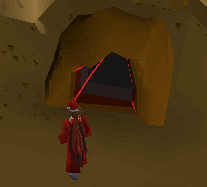 The Fight Pit is located beneath the Karamja Volcano, in the TzHaar city. You can either teleport or take a boat to Karamja, and then just climb down into the Volcano. Near the entrance to the Volcano should be a Cave Entrance, which will bring you to the city. Before actually starting the game, you'll probably want to check out the city. You'll find that there is a bank in the northern part of the city, to the west of the cave entrance. There are also various shops for Runes (up to Death), all types of Ores and Gems (even Dragonstone! 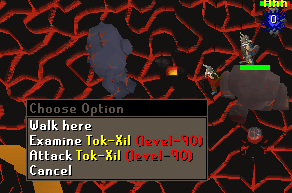 ), and the new Toktz and TzHaar weapons. There's even a Lava Forge for smelting ores, and a Sulphur Vent for cooking food. For more information about the city, please see our TzHaar city guide. The Activity starts in the northwest section of the city, although you may have to wait a bit until the next fight starts. Until then, you can look through the Viewing Orb to watch the progress of the battle. You can't attack until your are told to do so. Any items can be brought into the Fight Pit, from weapons and armor, to food and other items. There are no teams. Even if you decide to team up with someone, if you manage to last until the end, you'll be forced to fight in order to end the battle. If you die in the pit, you don't lose anything. Once you're ready, go inside the waiting room with everyone else and wait until the current fight is over. Once you're told to fight, it's basically you-against-everyone-else. Of course, it starts out "easy," with only other players attacking, but naturally it will get more difficult after awhile. If the round starts to drag on, you'll see that monsters will begin to appear. They're the strange flaming bat-like things. These are the stronger blob-like monsters that come out after the bat-like ones. These monsters are much stronger than the others and they will use both Ranged and Melee attacks. Note: If the battle goes far beyond a certain amount of time, which currently appears to be 40 minutes, everyone remaining in the pit will start taking damage. At the top-center of the screen, you'll see the current Champion and the number of foes remaining. The JaylYt-ket (Champion) is defined as Powerful and Strong. If you are the Champion, you will get a Red Skull above your head and be forced to play the next battle. Champions are rewarded with the TzHaar's Tokul (money) to spend on weapons and items spread throughout the city. The amount of Tokul is based on the number of enemies you kill and their combat level. So for example, if you killed 20 enemies that were level 100, you'd get 2,000 Tokul. This is why it is pointless to team, as you will end up facing each other, so it will be friend against friend and enemy against friend in the pit. The game ends when there is only 1 player left standing. The new TzHaar and Toktz weapons can be bought from the TzHaar-Hur-Tel's Equipment Store in the eastern part of the city. You can only buy these weapons with Tokul, which is rewarded by being the Champion of the fight, or from killing the monsters in the Fight Pit. Note: The Toktz-xil-ul is similar to Throwing Knives and requires 60 Ranging.